A look at how mankind's struggle with winter has been reflected in western art throughout the ages, with contributions from Grayson Perry, Will Self, Don McCullin and others. Winter was not always beautiful. 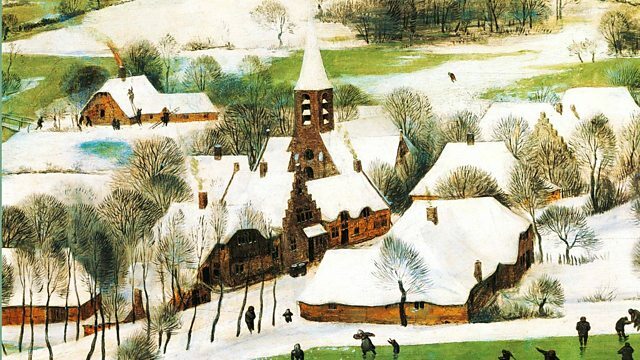 Until Pieter Bruegel painted Hunters in the Snow, the long bitter months had never been transformed into a thing of beauty. This documentary charts how mankind's ever changing struggle with winter has been reflected in western art throughout the ages, resulting in images that are now amongst the greatest paintings of all time. With contributions from Grayson Perry, Will Self, Don McCullin and many others, the film takes an eclectic group of people from all walks of life out into the cold to reflect on the paintings that have come to define the art of snow and ice. Performer: Boston Symphony Orchestra. Choir: Tanglewood Festival Chorus. Conductor: Seiji Ozawa.